On the eyes, this is a beautiful onion skin tone of pale, translucent orange with aromas of light stone fruit, mandarin citrus and crushed rocks. The palate is ever-so-slightly off dry with nice acidity and echoes the aromas with flavours of nectarine and ripe apricot, Granny Smith apple, white blossom and a touch of dried herb. WSET Good plus – held on the skins for four hours to get this beautiful colour before draining and pressing. What a great little summer wine – refreshing and delicious. 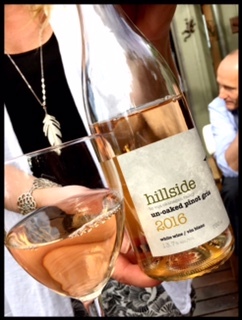 This entry was posted in British Columbia, Pinot Gris, WHITE and tagged 2016, BC, Canada, Hillside Winery, Naramata Bench, okanagan valley vqa, pinot gris, white wine. Bookmark the permalink.